This is a written review of 'VT4 Classic' created by James and Jade who own 'Vaper Train', A web based E-cig store situated in Wellingborough, Northamptonshire. The juice is 18mg 50pg/50vg, and is one of their new E-liquids in the 'VT Smoking Car' Range. A new line of Premium made juices using only the best ingredients which are all sourced in the UK. This flavour is the only one in this range at the moment and more will be getting added to this range soon. 'VT4 Classic' - Our 'VT4 Classic' takes me back to when I first started vaping on a 510 refillable. After trying disposable E-cigs we transferred to a refillable variety, and found a really nice Classic RY4 from a European manufacturer. This specific RY4 has always been my favorite, but as it was too expensive, I had to let it go. Until now that is. We have rediscovered and created our take on this classic RY4 I love so much. Our VT4 Classic is an RY4 flavour that should not be mistaken with any RY4 from manufacturers such as Hangsen or Dekang. On opening the bottle, the aroma straight away, told me it was a tobacco, and I could smell the sweet caramel and a slight hint of vanilla, sensually mingling in the background, so delicate and so faint, but also very nice. Anyone who knows me, knows I'm an RY4 fan. I love my RY4' tobacco flavours, and I can't say how many I have actually tried, but it's been a lot. There are quite a few I really enjoyed but some I just was taken by, but it didn't stop me from purchasing more to see what they were like. Doing my research on this juice, I found out quite a lot of interesting facts about RY4 itself. The history of RY4, all started in China. 'Ruyan blend #4 E-Liquid, was originally made by Chang Ning Dekang Biological Technology Company, for Ruyan Group Limited. They made different blends of the tobacco and numbered the blends. 'Ruyan blend #4' became just RY4. Ruyan Blend #1 - RY1: Very subtle mixture of Tobacco aromas. Ruyan Blend #2 - RY2: Dry tobacco, raw, with no sweet aftertaste. Ruyan Blend #4 - RY4: Tobacco blend with the taste of caramel and vanilla. Ruyan Blend #5 - RY5: More of a tobacco flavour, quite strong and earthy with very little sweetness. RY-Hi5 - sweeter than RY4 and has a richer and deeper flavour. The RY4 flavour became very popular, and E-Liquid manufacturers worldwide set out to try and replicate this complex tobacco flavour. It became so popular with everyone, the DIY enthusiasts were buying the flavours to see if they could make this themselves. Amongst most vapers, RY4 is considered a legend, with its exciting history and loads of variations of the flavour. It became very important that every vaper out there had to try this fantastic flavour. Word spread fast and RY4 got worldwide acclaim. I dripped some of Vaper Trains RY4 into my dripper, and on the Inhale, A beautiful rich balanced tobacco, Mellow and smooth, but with just the right amount of caramel and vanilla. Not overpowering, but balanced perfectly together. This blend was sweet, as an RY4 should be but not overly sweet. Very moreish, creamy, and sublime. Infact the perfect vape for anytime time of night or day. On the exhale, the creaminess of the caramel filled my whole mouth and gently caressed my palate with a softness that made me crave for more. It was subtle, but at the same time punchy as the tobacco took over the sweet flavours and mingled with each other to the stage I couldn't put it down. This is definitely one I could vape all day. This liquid had to be one of the nicest RY4 blends I had tried. It had everything you'd expect a decent RY4 to have. 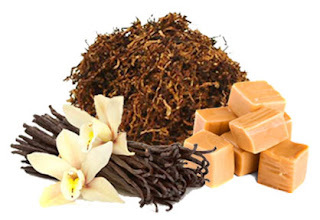 The tobacco was just right for me and the caramel and vanilla didn't overpower the flavour of the tobacco in any way. It was perfect. The flavours blend perfectly with one another and the vapour production was extremely good, with it being a 50/50 blend of vg/pg. The throat hit was spot on for an 18mg juice and I didn't find a single flaw with this one. This is a juice I would happily vape all day, it is that good, and I'll be ordering the 50ml size. Pity it's not sold in bigger bottles.